Rice is very important to Korean cuisine. 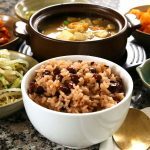 It’s the center of pretty much every meal and in fact the Korean word for “cooked rice” (bap: 밥) can also mean “meal.” Most of the time we Koreans eat white rice, or multigrain rice, but on special occasions we prepare rice mixed with red beans, called patbap. Patbap tastes a little sweet, salty, and nutty and has a wonderful texture. It’s also a lovely reddish-purple color, which is one reason it’s prepared for special occasions like birthdays (and especially children’s birthdays): the red color is known to ward off evil spirits in traditional Korean culture. This special occasion rice needs time to prepare, which is one reason Koreans don’t have it often. Red beans are very hard so you need to spend some time boiling them to make them soft. I use short grain rice in this recipe but you could also make it with chapssal (sweet rice) which will be really chewy like rice cake. Once they learn individual recipes, my readers and viewers often ask me how they’re used together to make a typical Korean meal. 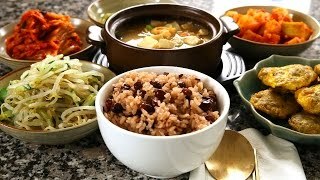 So in this video I show you how to make a nice meal using Korean banchan (side dishes) and mitbanchan (preserved side dishes), including kimchi, kkakdugi (cubed radish kimchi), wanja-jeon (meat patties), sukju-oi-namul (a mung bean sprout and cucumber side dish), and doenjang-jjigae (fermented bean paste stew). Rinse the beans in cold water and strain. Put in a heavy pot with 4 cups of water. Boil for 10 minutes over medium high heat. Then turn down the heat and cook for 50 minutes. Strain the beans and reserve the red bean water to make rice with later. Let the water cool down thoroughly. Put the rice into a heavy bottomed pot. Rinse in cold water and drain, then scrub the wet rice with your hand. Rinse and drain a couple of times until the drained water is clear, then drain out the last of the water by tilting the pot as much as you can. Add the cooled down red bean water. We need 2½ cups so if you don’t have enough make up the difference with clear water. Add the cooked red beans and salt. Let it soak for 30 minutes. Boil for 10 minutes over medium high heat. Open the lid and mix it up from top to bottom so everything is cooked evenly. Cover, turn down the heat to low, and simmer for 10 minutes. Remove from the heat and fluff up the rice with a rice scoop or spoon. Keep it covered until you serve. Serve with side dishes. Posted on Monday, February 27th, 2017 at 5:45 pm. Last updated on April 4, 2017. Posted September 6th, 2017 at 1:04 pm | Log in to reply. Hello Maangchi!! I am always excited to read your blog. I have a small question. I recently have purchased a rice cooker, and I am trying to get more familiar with using it. My husband is from South America (Ecuador) and we eat rice daily, which is why I purchased the rice cooker. Can Patbap be made in a rice cooker? How do the steps change?? Is there any possibility of you doing some recipes for rice cooker users? I would fall over with joy!! You are the best. Thank you in advance for your reply. God bless! Posted September 14th, 2017 at 8:41 am | Log in to reply. You can make it in a rice cooker, but first you need to soak the red beans to make them soft first. Posted June 9th, 2017 at 3:13 pm | Log in to reply. Thank you very much for the recipe Maangchi! We love Patbap/Sekihan! Posted April 15th, 2017 at 12:05 am | Log in to reply. I usually do it the easier way. All I did was presoaking the red adzuki beans for at least 1/2 a day or overnight then cook them together with white rice/ brown rice in a rice cooker. This way the adzuki beans will be soft enough as it cooks along with the rice . Posted April 14th, 2017 at 4:04 pm | Log in to reply. Posted April 1st, 2017 at 12:18 am | Log in to reply. Hi there! My son made your potatoes the other night and they wer soooo good! Going to make the patbat tonight. Can you tell me when to add the beans please? Posted April 4th, 2017 at 5:30 pm | Log in to reply. Posted March 10th, 2017 at 2:49 pm | Log in to reply. Posted March 3rd, 2017 at 4:44 pm | Log in to reply. Posted March 2nd, 2017 at 8:46 pm | Log in to reply. Gosh this is so beautiful with all the side dishes. Today I bought some azuki beans and will make the Patbap tomorrow. Sounds so delicious. I’m anxious to see the difference in taste of azuki beans and American red kidney beans. yum. Posted March 6th, 2017 at 10:24 am | Log in to reply. Posted April 3rd, 2019 at 1:16 pm | Log in to reply. This recipe was originally posted on February 27, 2017 at 5:45 pm by Maangchi. It was last updated on April 4, 2017. The video was watched 865,624 times on YouTube & has 19,098 likes!